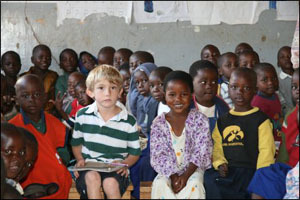 During the entire month of July, 2007, my family and I traveled to, and resided in, Embangweni, Malawi while I volunteered as a physician in clinic and hospital for the Church of Central Africa Presbyterian (CCAP). Also located on the grounds of the century-old mission are primary and secondary schools, as well as a school for the deaf. Embangweni is located in central Malawi, near the western border with Zambia, and serves as a trading center and educational locus for the surrounding region. The hospital consists of separate wards for men, women, pediatrics (under 5 years of age), and maternity. 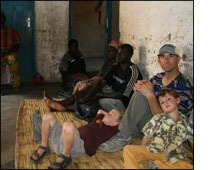 During my stay, a typical census was 12-15 men, 25 women, 10-15 infants, and 40-plus maternity patients. In addition to inpatient wards, the hospital offers outpatient clinics for general medical care, HIV/AIDS, nutrition, prenatal care, dentistry, and a theatre for surgical cases. Outreach clinics in various locations are administered by the hospital, as well. Clinical care and call duties were performed by medical assistants, clinical officers, visiting medical students, and myself as the sole M.D. The hospital was also visited periodically by specialists. My typical day began with services in chapel in the local Timbuku dialect of the Bantu language. The choir was absolutely amazing. After chapel, we gathered for morning report from the various wards and then proceeded on to daily ward rounds. My primary responsibility was the men's ward, where I had the enlightening but disturbing experience of overseeing the deaths of several patients, to whom we had simply nothing to offer. Most of these men were dying of AIDS. We worked in an environment of chronic shortages (once we had a seizure patient, and no anti-seizure medicines), but I was continually amazed at the amount of care provided in this trying environment. During afternoons, I generally staffed a clinic room, seeing patients referred from the medical assistants or clinical officers. I was surprised, although I don't know why, to find that most complaints were very similar to what I would see in my stateside clinic, e.g." my feet are swelling", "my back hurts", "I have a rash". From time to time, I would travel by Land Cruiser ambulance to outlying clinics in remote locations. As I'm sure most people report following medical mission trips, the most satisfying thing for me was not the practice of my profession, but rather the connections made with people. This wonderful experience was enhanced by the opportunity for my entire family to accompany me. I think my four children gained more than I could have imagined. They still talk about their friends and experiences everyday. Thank you to the people at the Benjamin H. Josephson Fund for assisting with our trip.